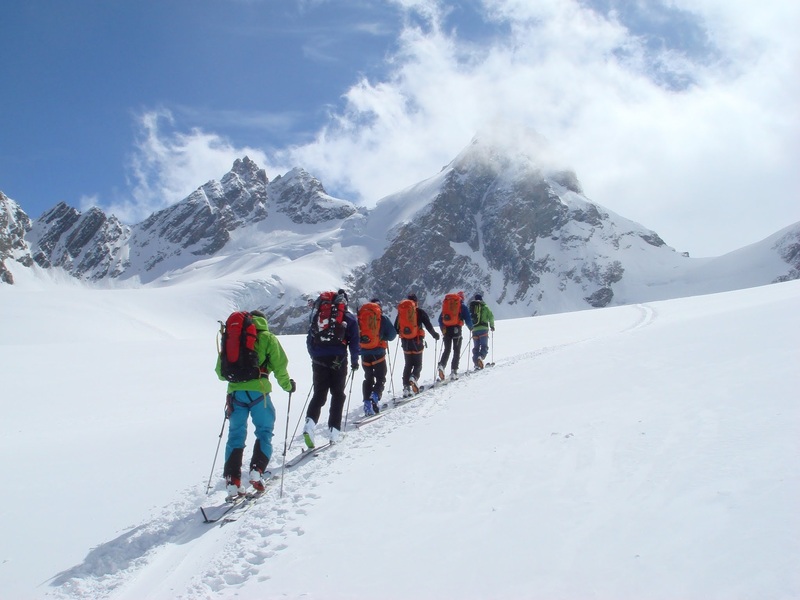 Ski-touring in the Chamonix valley allows you to reach remote slopes, making it is easier to seek out fresh natural snow. It is also a nice way to find some quietness, away from the crowds and pistes. 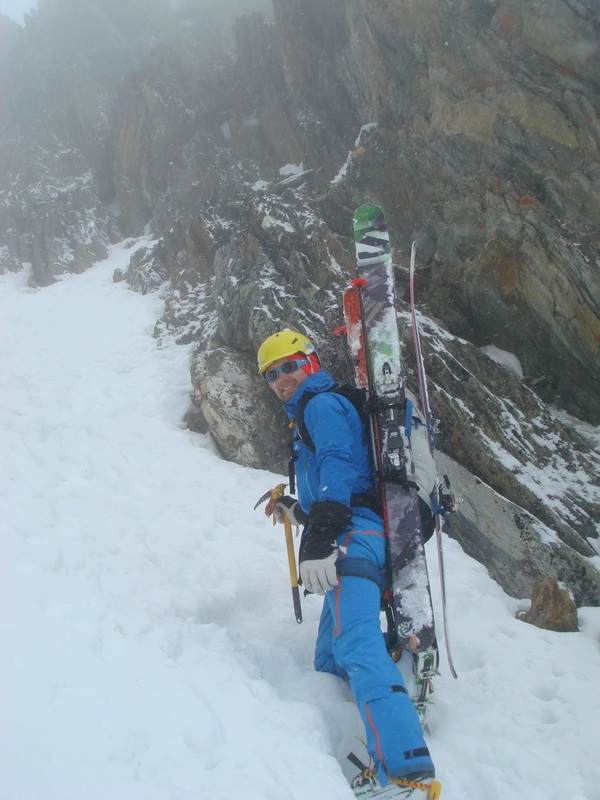 For a discovery of the activity, Chamonix Mountain Guide advise to start from the top of a mechanical lift, and therefore enabling you to enjoy several descents in the day. 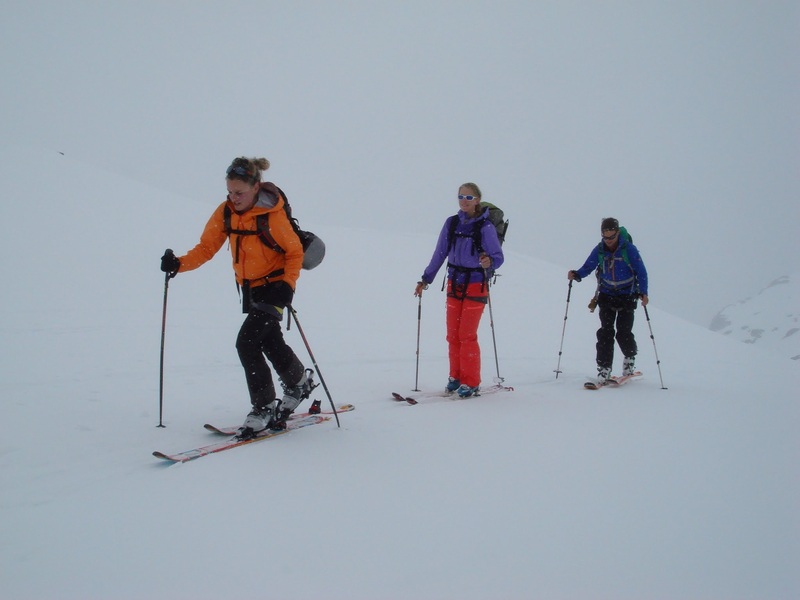 The requirements to participate in ski-touring are some experience of off-piste skiing, and a good level of fitness. 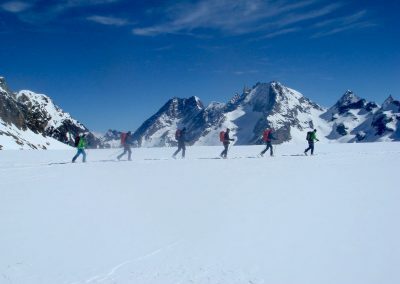 For an experienced team the guide will suggest thousands of possibilities, even totally out of the resorts, or taking several days, perhaps also eventually spending some nights in high altitude mountain accommodation. Snowboard touring is also possible with snow shoes. You carry them in the backpack while riding, and carry the board on the way up. A split board is another option for boarders who have a little ski experience. The board is separated into two wide skis on the way up, with skins provided, and joined back together again for the descent. This allows you to hike up while not having to carry the board. 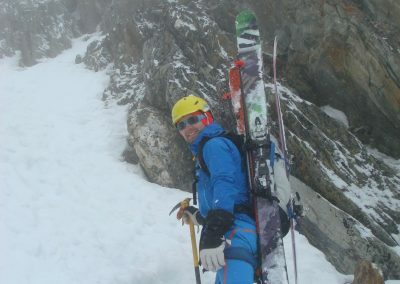 Avalanche rescue training is included in the program and will take around an hour for a team of four persons. 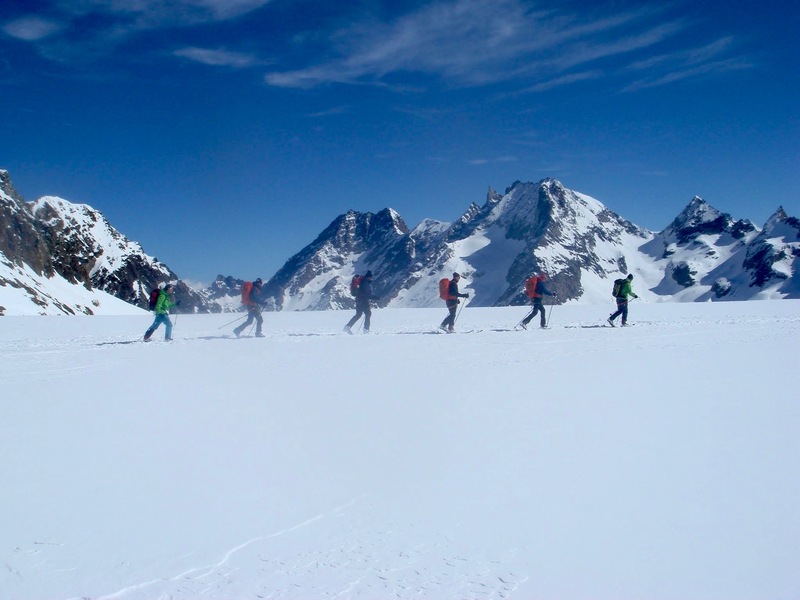 On request and depending on temperatures and wind conditions glacier skiing and orientation may also be included. Ex 1: From the top of the Flegere or Brevent lifts in the Aiguilles Rouges, we put our skins on and reach the ridge at around 2700m (this takes about 45 minutes to 1 hour). This first ascent is made in the sun if the weather is good and offers a fantastic panorama on the Mont-Blanc range. After a drink and some photos we choose a first descent, generally on the quiet north side. The longer the descent chosen, the longer next ascent will be (minimum 30 minutes) to reach the next high place before the final long descent towards Buet, a charming village. From Le Buet, we take the train back to Chamonix, about 25 minutes, or there is more skiing from the nearby Vallorcine gondola for those who planned a day pass and like long skiing days. The lifts reach an altitude of 2300m. From here it’s possible to hike up a bit more to reach the top of some short off-piste runs. Alternatively, there are many options for much longer runs that are totally remote from the resort, such as the Swiss eastern side (1000m height lost ending in Trient village, returning to Vallorcine in 30 minutes). Ex 3: Glacier des Rognons we start by descending toward the Argentieres glacier (the start of the descent is accessed by lift). Then we ascend the Col du Passon (650 m height gain). From here we descend the Le Tour glacier through the left side (total height loss: 2400 m). A big and exciting day out for experienced skiers. Chamonix Mountain Guide will provide transceivers for each person, one extra shovel / probe for the team, harnesses for glacier skiing, and common safety gear such as a rope (and a second one if needed). Some ice axes may also be provided if necessary.